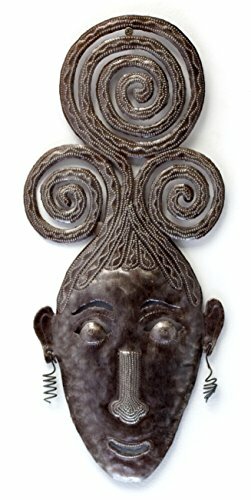 Swirly Girl Mask Haitian Metal Art 7.5" X 17.5"
Spring Garden Circling Butterflies, Haiti Metal Wall Art 23" x 23"
Following four generations of tradition, each piece of Haitian metal art is made entirely by hand with simple tools. Starting with a cast-off steel drum, the metal is cleaned, sanded, and pounded flat. 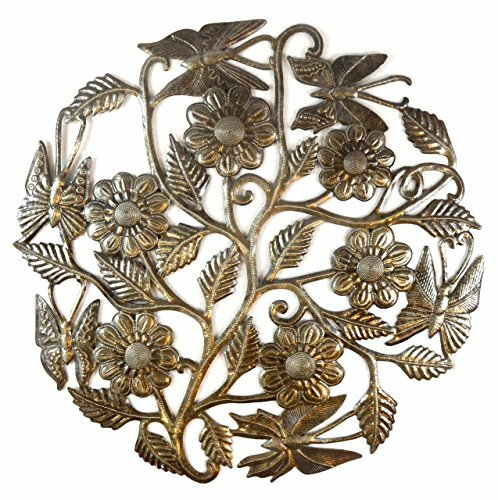 From there, the artist chalks his design onto the metal and then begins the heavy, tedious work of cutting out the pattern with a hammer and chisel and giving the piece detail and dimension. Finally, he applies a clear-coat to the piece, which protects it and makes it perfectly suited for indoor or outdoor display. A few nails and a hammer are all you'll need to hang your sculpture. Look for a place where the design is joined or notched and put the first nail there. Use a second and possibly a third nail, if the piece is large, in other joined or notched design elements within the sculpture to straighten and secure it to the wall. 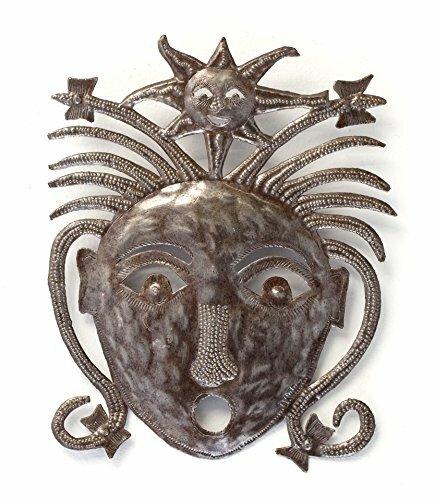 Haitian metal sculptures all come with a clear, weather-proof coating but if exposed to the elements, they will begin to rust over time. This isn't necessarily a bad thing, but if it's not the look you're going for, fear not. Just pick up a can of spray on enamel clear coat and go to it. Once a year will do it. 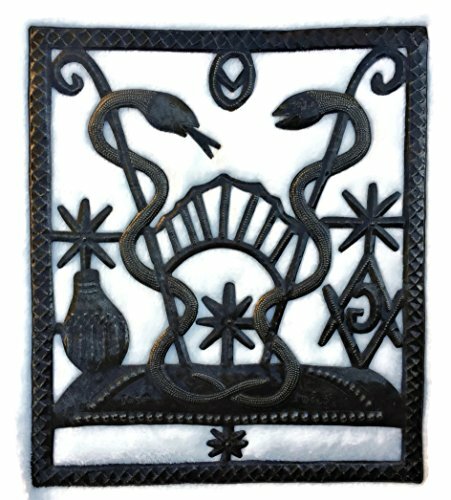 Damballah-Wedo, Veve Made from Recycled Steel Barrel in Haiti 13 3/4" x 15 3/4"
Firing, sanding, pounding, chiseling, cutting and shaping, Haitian artists fashion each beautiful recycled metal sculpture by hand. It is a tradition well-established in the village of Croix-des-Bouquets, as fathers have taught sons and neighbor has taught neighbor for four generations. Hanging your metal art is easy, once you know how. Choose a place it within two design elements that are touching or notched toward the center of the piece and drive a nail into the wall at that point. Using a second and possibly a third nail, place those in other notched areas within the design to secure it firmly. Avoid placing nails in the eyes or mouth. A viewer's eye will go straight to those elements and a nail there will draw attention to itself. You don't want the nails to become part of the details - you want them to "disappear." 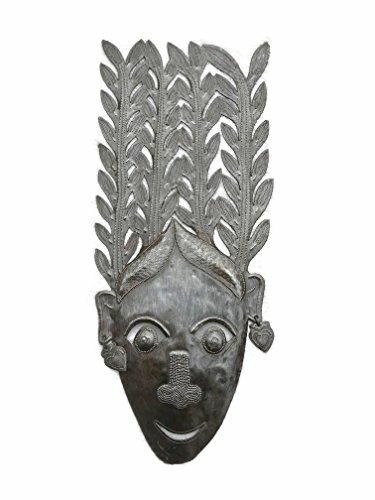 Copyright © Wholesalion.com 2019 - The Best Prices On Haitian Metal Mask Online.